Posts from our 2015/2016 season. We’re proud to feature class of 2016 alumna, Avery Pottle. 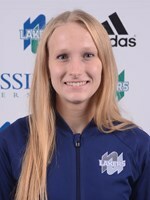 Avery is going into her third year playing middle blocker with Thompson Rivers University in beautiful Kamploops, British Columbia where she is studying Honours Biology. She plans to attends medical school to become an obstetrician and as a two-time academic All Canadian, this student-athlete will no doubt achieve her goal. “My time with Durham Rebels helped me to understand the importance of a strong work ethic, and committing 100% to everything I do. I also had great mentors like 2009 Rebel alumna Katie Fitzgerald who set an example for me of the kind of player I want to be.” Avery joined the club back in 2011 as a 13U player. She says she developed strong bonds with her teammates over the years, many of whom she still remains in close contact. We are very proud of this former Rebel and watching her excel in the classroom and on the court is something we want for all of our athletes. Way to go, Avery — keep killin’ it! DRVC’s Class of 2016 alumna Stephanie Armstrong has been named the OUA East Division Rookie of the Year for 2016-17. Armstrong was coached at DRVC by veteran head coach Gerald Brunt. The 5-foot-6 setter had a team high 453 assists in 18 matches during her freshman campaign, while her 2.17 digs per set was fourth-highest amongst her Lakers teammates. The Pickering, Ont. native becomes the first Lakers player to earn Rookie of the Year honours since the program was established back in 2013-14. See the OUA news release for full details. It has been an awesome year for the DRVC 14U volleyball team. Although the year is over, there are many amazing memories for this talented team of young ladies to cherish. This group of girls spent the last year travelling to two tournaments a month all over Ontario representing Durham Region. The team consists of eight local girls from S.A. Cawker Public school along with three new friends from Whitby and Oshawa. Their two coaches are Mr.Koot (retired teacher from S.A. Cawker), and Deb Stevenson, a teacher from Port Perry High School. During the regular season the girls earned both gold and silver medals along with several other top five finishes. The girls also achieved great success in Kitchener/Waterloo in the Provincials in March receiving a bronze medal for their efforts. It was three days of hard fought matches and exciting volleyball. At the beginning of May, the team travelled to Ottawa to attend Nationals. Again it was an intense, nail biting, three day event and after nineteen hard fought games the girls emerged victorious capturing a Gold Medal in their division. None of the above success could have been achieved without our amazing coaches, along with the girls undying dedication and tireless hours of practice.